The gyan yagna on ‘Essence of Shri Krishna Leelas’ at SSDVM Durban by Swami Abhedananda got off to a great start. 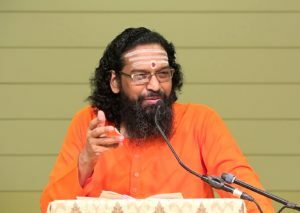 Swamiji enlightened the audience with the knowledge of the true source and nature of joy in life. 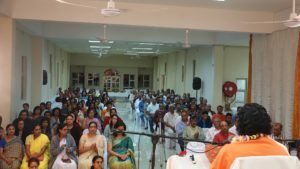 Taking examples of exemplary characters from Bhagawat, Swamiji impressed on why our relation with the Lord must be the sole relation and how that alone is the provider of fulfillment and happiness in life. In our life, we put a lot of efforts to get little external joys. In childhood we obtained toys to get joy, then we studied to get joy, then we got married to get joy, then we had children to get joy, then we took the children to school, college and got them married to get joy, then we desire for grandson to get joy. But ultimately the joy, which we thought life would give, didn’t come. Thus a question should come in our mind – Where was our mistake? Joy of ahankaar (ego): This is the joy which you get when someone compliments you for your beauty, intelligence, education etc. Joy of mamta (attachment): This is the joy which you get from your family, children, house, or other possessions. Joy of sense objects and sense organs: When your sense organs meet the sense objects, then you get momentary joy. Ex: going out for recreation or for sight-seeing etc. Joy of habit: This is the joy born out of wrong habits such as smoking, drinking, tobacco eating or playing cards etc. These are the four sources… Alas! All these joys end up in sorrow. A person who has abhimaan, he will have more sorrow in life than the person who has less abhimaan. The joy of attachment will always end-up in sorrow because the object to which you are attached to will be list with time. The joy of sense objects will always end-up in sorrow because sense objects make you their slave. Lastly, habitual joy ends up in addiction and hence pangs of withdrawal. Joy cannot be outside of us as we cannot be committed to anything external because all external things will leave us in due time. Sorrows are nothing but expectation of joys from the wrong places. There is no joy which is not in us. 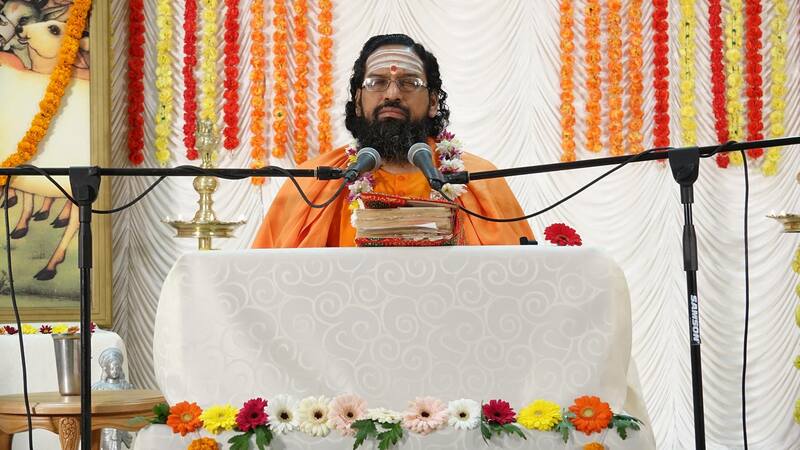 The words of satsang break the conviction that world is required for our joy. Joy is not the nature of anything in this world; it’s the nature of the Self alone. Just as you can’t take away sweetness from sugar because its nature is sweetness, similarly you can’t take away joy from the Self because joy is the nature of the Self, and that nature is the Parmatma or the Ishwar alone. You may be physically dependent but don’t get emotionally dependent on anyone. Freedom from emotional dependence is called Moksh (liberation). Our own self is full of joy. Therefore, when we sleep we get joy of our own Atma. It is said in Shrimad Bhagawatam, Vasudevji is pure mind and Devakiji is subtle intellect; and from a pure mind & subtle intellect alone the Lord manifests. Even after having an extremely tough life, Mother Devaki never had any complaints. When Kamsa, holding her hair, prepared to kill her, she was quiet. When Vasudevji promised to Kamsa that he would give away all their children, she was quiet. When her six children were killed one after another, she was quiet. She only spoke when Kamsa tried to kill the seventh daughter, because she knew it was not her daughter. The Lordliness doesn’t come in a person unless there is sufficient renunciation, silence, ego-less-ness and beauty in the heart. Similarly, Vasudevji’s whole attempt was that Bhagwan should be born. He did not bother about other things. He was known to keep his words and therefore even Kamsa trusted him. He had a very pure mind. The birth of Bhagwan means that Bhagwataakaar vritti (the thought of Lord) is born. Unless the thought of Lord is born in our minds, we will never be quiet because other lower thoughts will constantly trouble us. Thoughts of expectation, anger, passion, jealousy etc. keep a person’s mind unnecessarily occupied. God is the biggest requirement of our life! Our emotional requirements in life cannot be fulfilled by any person. We want somebody to love us at all times, at all places, he must not hide anything, he must be all-powerful, most beautiful and must never die. These requirements can never be fulfilled by a wolrly person. Lord alone can fulfill these. We must experience and realize this fact. Mother Yashoda had no blood relation with Bhagwan Krishna but she was closer to Bhagwan than Mother Devaki, because the sense of ‘myness’ in Mother Yashoda was very strong. She felt ‘He is my baby, my closest!’ In our life also, lot of situations come where Lord says, ‘Leave the world, I am yours. Don’t go too close to anybody. Don’t get attached to anybody. Be close to me. Make me yours’ but we fail to hear Him. As a devotee, whenever you list out the things that you possess, and you say, my house, my country, my car, my son, my father etc., in that list of yours keep Lord’s name too! Nobody’s life can be simple and easy at all times. There are always new problems and challenges that come your way which you had not expected. Everyday situations come and situations want you to react and respond. Even if you don’t say or do anything externally, internally you respond. Life is not a simple matter; you can’t take it for granted. What is required in facing the life is that we feel powerful from within. Because of our lack of faith, we feel that situations and people are stronger than us, our diseases are stronger than us, our relatives or bosses are stronger than us. But if a person feels somewhere that ‘I am bigger than the situation’ or ‘I have someone bigger with me’ then situation appears smaller no matter how difficult it is. Let us call the Lord, let us become Mother Yashoda. Yashoda means ‘Yashamsi dadati’, one who gives fame to God. Our whole life is very self-centric, because our own sorrows and joys are very important for us. In a devotee’s life, Lord’s joy and sorrow is most important. Let us please God. Let us make our heart soft. Our heart has become hard because we are holding onto the world. Yashodaji’s heart was very soft. When she used to worship, she used to say, “May I belong to Bhagwan alone. May this body, may my breath, may my life belong to Bhagwan. May I give fame to Bhagwan. My sorrows should never become important for me.” And therefore, Yashodaji went through a lot of sorrows, but for her Lord’s joy was more important. Nanda baba is the one who gave ‘anand’ (happiness) to everybody. Nanda baba used to think, “Oh Lord! May you be happy. May Lord Vishnu be happy.” That was his emotion. We don’t have such emotions; we only try to satisfy our vasanas. We are hurt when our ego is hurt, and we are happy when our ego is satisfied. Let our goal in life not become small and self-centered. When the demoness Pootna came to poison baby Krishna, she dressed herself in a very attractive manner. Everybody got attracted towards her form. So much so that even Mother Yashoda left little Krishna and started seeing Pootna. In our lives too, Pootna comes in the form of attraction for the world and we tend to forget the God. Where no joy is present, we see joy; where there is no fulfillment, we try to get fulfillment. That is Pootna. Closeness is not bad, but forgetting the God is bad. All closeness should take us closer to the God. Keep the Lord above all! As a 3-months old baby, when baby Krishna turned for the first time, Yashodaji organised a celebration. In that celebration there was a cart, and on that cart, there were buckets of curd, yogurt, rock-sugar etc. Yashodaji kept the Lord beneath the cart and went to attend the guests. Bhagwan started crying and Yashodaji did not notice, the Lord then kicked the cart and the whole cart fell. Yashodaji then ran and picked up the Lord. The cart was a demon named Shakatasur and the Lord killed him through this leela. 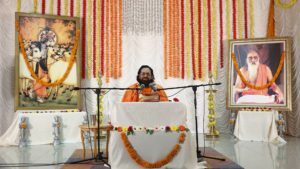 The message in this leela is – to have matter and physical things is not bad, but to keep God below those material possessions is not correct. Priority of our life should not be social work, it should not be to earn money or have a big bungalow; Lord alone should be our first priority. Bhakti is a path of weeping for the Lord. When a devotee feels he cannot live without Lord, cannot eat without Him, or sleep without Him, such a thought becomes his asset. When Bhagwan saw Yahodaji in distress, He held Trinavart and killed him. 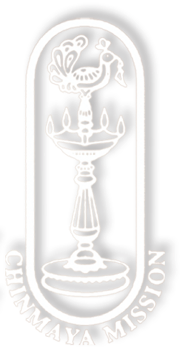 Trinavart represents ‘kaam’ (desire). Kaam is the one which blinds us; we don’t see anything in front of our desire and expectation. Those devotees who call Bhagwan when they are blinded by desires, Bhagwan surely comes and protects His devotees. Nobody’s life is exactly as he had expected. Sometimes good happens, sometimes bad happens. New people, new friends, new enemies, all come and go. Nobody’s job, children, house are as per his expectations. On analysis, we can only conclude that there is someone else who is the master mind of our life; who decides what we get and what we don’t. When the life is so much under somebody else’s control, don’t you feel it is wise to be with Him? Don’t you feel it is wise that we hold Him and ask for support? When we have less power, is it not wise that we take support of someone who has more power, who can secure us & provide us reliable assurance? Why is Bhakti needed in life? To seek support from the Lord, we need to have a relation with the Lord. 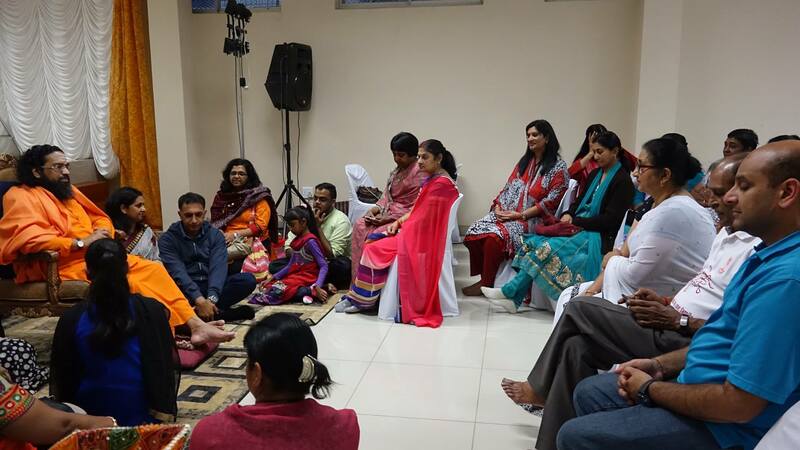 Having relation with the Lord is called ‘Bhakti’ (devotion). There is a big gain in having devotion for the Lord. First thing that will happen with Bhakti is that your worries about the uncertain future will be over. There is a strong assurance that my life may have problems but Bhagwan will take care of those. Second thing that happens when a person becomes a devotee is that he has infinite goodness. The person becomes very tolerant. 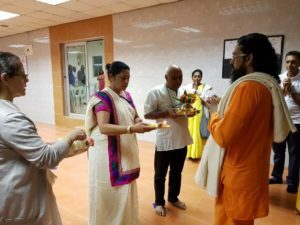 The power of acceptability of some bitter situations comes from Bhakti. That which makes the bitter as butter is devotion, and when bitter becomes butter, you become better. 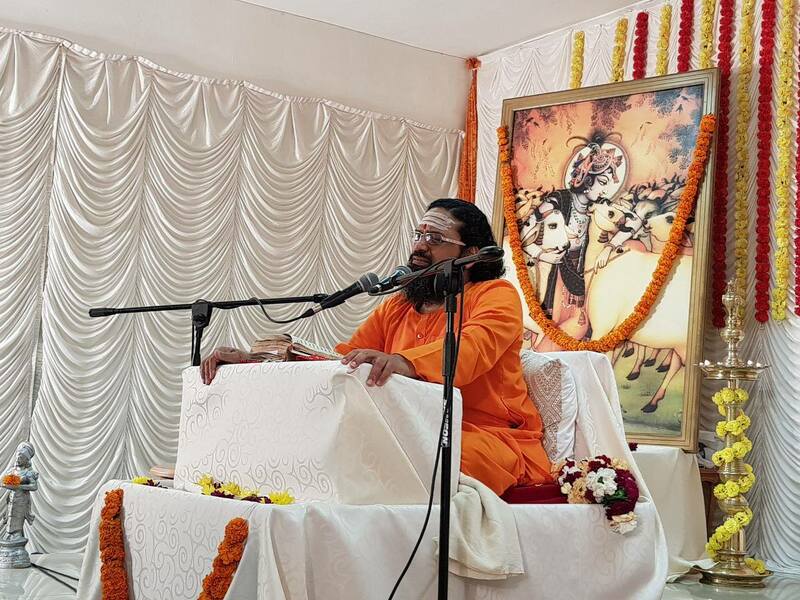 Third thing that happens when devotion comes in your heart is that Mahatmas come around your eyes, satsang comes around your ears, seva and puja comes in your hand, your feet reach Teerths. Life becomes an effortless journey. Fourth thing that happens with Bhakti is that the person becomes softer. In love, you have to become soft, quiet, and humble. When you are hard, you can’t love. Just as the big mountains at the banks of rivers, when they have constant stream of water flowing against them, become round and curvy at the bottom; similarly our hard heart, when it constantly takes the Lord’s name and thinks about the Lord, it becomes humble and soft. Another important aspect of loving the Lord is that love should be manifested. Love always demands some expression. People say, ‘I don’t do Puja, I don’t offer flowers to Bhagwan because everything belongs to Bhagwan.’ They don’t understand that unless you give, you cannot express your love. The joy of loving is to get defeated by the beloved. Moment you get victorious from your beloved, that will be a loss in love. Moment you win in argument, you will lose a friend. So, tell the Lord that You win and I lose; I shall do as You want. Gargacharyaji named Bhagwan Krishna and Balramji in a cowshed in Gokul. To call someone or to bring him close to you, you have to know the name. One of the potent means to melt the Lord’s heart and pull Him towards us is to call His name ‘Krishna’ with love. 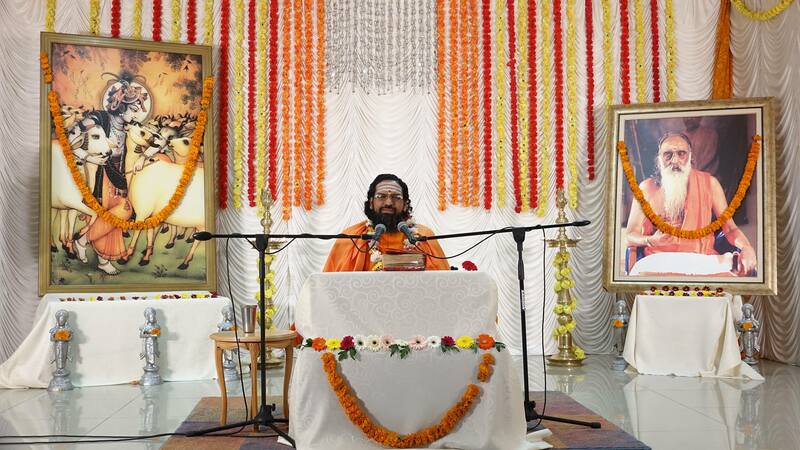 This is a Sadhna through which Bhagwan comes in our hearts and minds. To love God is a matter of great fortune. Because fortune is that which gives us joy. It is a fortune to take Lord’s name, through which Lord comes in our heart. When Lord comes in our heart then other unimportant things go away. One is naam (name) and the opposite of that is maan (ego). The power of the name of the Lord is that it takes away our ego. How can we love the Lord? In Sanskrit, leela means ‘lainam lati iti leela’, that which dissolves the mind is called leela. To love someone, we must listen about him every day – how he walk, how he talk etc. The more we hear about the Lord, the more our mind will become softer. Put your mind in the Lord, your mind will become purified. We are known by where our mind relaxes in the absence of work. In our free time, we like to watch the television or play games, instead we must revel in the Lord’s leelas. Only those who are fortunate get joy in the katha of the Lord. Why Bhagwan used to steal butter from houses? Bhagwan stole only to give the joy of his company and mischiefs to the Gopis. The Gopis of Vrindavan were rishis (sages) in their previous birth who had prayed to the Lord. For many others around, whole life passed without experiencing the joy of Kanha’s mischiefs. Is the same not happening to us? When we love someone, we want to feed, we want to offer, we want to cook, we want to give him something, and we want to serve. Many rishis were there, who thought, ‘In next Dwaapar yuga, let me be one Gopi in whose house Krishna Bhagwan would come, I will not give Him the butter, because if I give, I will have doer-ship of giving. Let Him come to my house and steal the butter from me. Let Him ask with authority.’ Thinking such they did japa of the Lord’s name. Such rishis were born as Gopis. Seeing the Butter-leela of the Lord even the devatas came and offered prostrations to these Gopis. 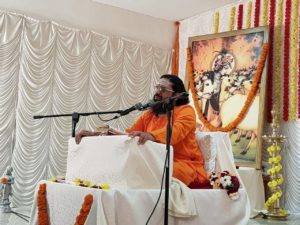 On the penultimate day of the yagna, Swami Abhedananda through his mesmerizing talk took every devotee to the beautiful streets of Vrindavan and brought to life the innumerable mischief of our beloved Kanha. 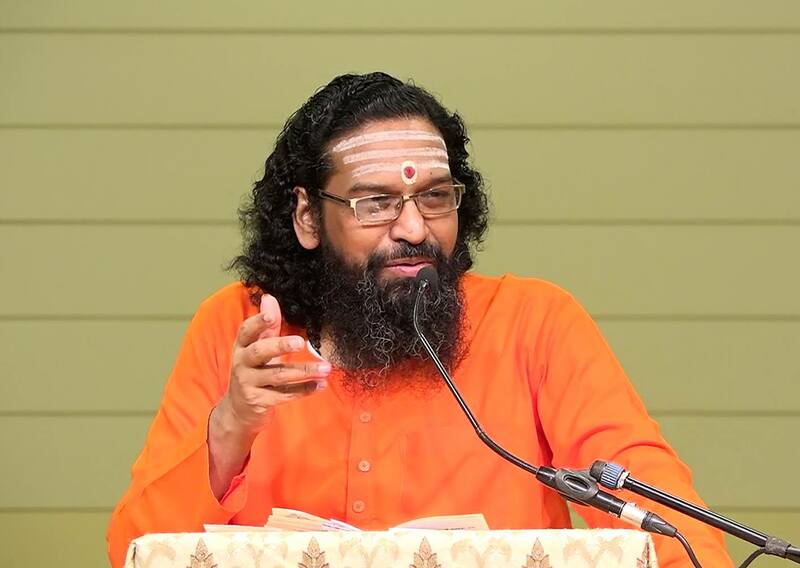 We bring to you a few gems from Swamiji’s enchanting talk. A person is weak or strong depending on whether he loves the higher or the lower. When a person loves the higher, he is strong; when a person loves the lower, he is weak. Strength doesn’t come from talents or qualifications, or money or contacts, strength comes from your love for the higher. A person gives his life for Guru because he loves his Guru. His bhaav for the Guru is, “Oh teacher! Whatever you will say, I will do that. If for my whole life I have to sweep the floor, I will do that. If for my whole life I have to cook for you, I will cook for you. If I have to carry you on my back throughout my life, I will do that.” Such strength in a disciple comes from his love, dedication and devotion for the teacher. From loving the small, weakness erupts; we become desirous. All small emotions, whether it is of anger, passion, jealousy, or lust etc., are because of our love for the small. Human being is not meant to love something small. Like a hand is not meant to walk and feet is not meant to hold, and eyes are not meant to drink, similarly mind is not meant to love something small. God has made the mind to love something big. Your strength is not your money, or beauty, or relatives, or your house; strength is God. And that God if you love, He responds. Moment you start getting response from God, you become a devotee. Seeing the love of God for us and God’s ability to take care of us, how can we not love Him? Let us learn to love Him. What Bhagwan Krishna steals is our butter-like heart; the heart which is like butter. A person’s nature should be such that the other person should become greedy to have that. Gopis had that nature. Gopi’s nature was ‘Krishna Trishna Murti Gopi’ – ‘the Murti (form) of the insatiable thirst of Krishna, is called Gopi.’ Gopi also means ‘Gobhihi pibanti shri Krishna rasamriti iti Gopi’ – ‘those who drink the nectar of Bhagwan Krishna ras, they are called Gopi.’ While hearing Lord’s katha, we should also not just hear, but drink it. We must not think that stealing of butter by Bhagwan is a childish act. Love’s demand is ‘Ask me something. I want to be controlled by you.’ The power of love is that whom you love, he wants to get into your control. The Gopis were such, they had done so much austerity and penance for the Lord that Bhagwan had developed thirst for giving joy to the Gopis. Bhagwan wants to be under our control, the only requirement is that we need to have the sincere demand in our heart to please Him. 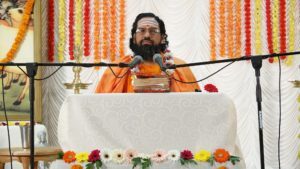 Our problem is that we think we are intelligent and have lost our innocence, love and softness, especially lost a devotee’s character to love the Lord. All the leelas of Bhagwan are only to pull our minds. Our whole problem is our mind alone, it runs in ten directions and then we have sadness, anger, desire, fear etc. Put the Lord in your mind and see how much joy is there. Are we not charmed by such Bhagwan who is running for us? Don’t keep Bhagwan unemployed in your life. Give the Lord some work, make Him your own. If you think of Kanhaiya even for a few minutes, your sorrows, anger, desires, passion, jealousy, worry, all will go away. Let the running mind run after Bhagwan and you see how the mind becomes quiet. One day Gopis decided to collectively go and tell mother Yashoda about Kanha’s mischiefs. They were actually not going to complain but to see Him. They had the thirst to see the Lord. We have thirst for money, for power, for son and grandson, to have love from others etc., but we should have thirst for the Lord. Thirst for the world goes only when you have thirst for the Lord. Have the thirst that, ‘Bhagwan, you be happy with me, I want to see you, I want to talk to you.’ There is no better relation than our relation with the Lord. Don’t just remain a believer of God. Transform the believer of God in you to the lover of God. There are 3 types of leela of the Lord: naam (name), roop (form) & dhaam (place). The Dhaam in Krishna katha is ‘Vrindavan’. If you go to Vrindavan, you don’t have to take the Lord’s name, you are automatically reminded of the Lord’s name. Vrindavan expresses the Keerti (fame) of Bhagwan Krishna. Even Lord Brahmaji prayed to become the dust in Vrindavan, so that when the dust of the feet of devotees would cover him, he would also gain devotion of the Lord. To give glory to Vrindavan, Bhagwan ate the mud there. 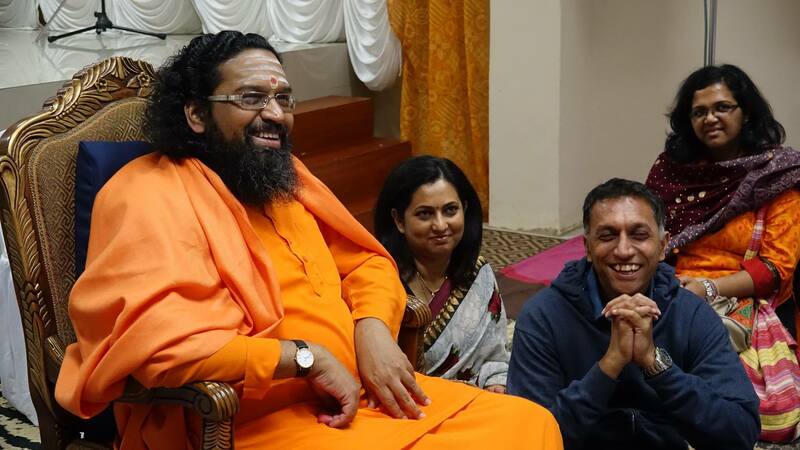 Swajan-vimohini Maya, Swa-vimohini Maya and Vimukhjan-vimohini Maya. One day in Dwarka, Bhagwan saw Himself in the mirror and said to Rukmaniji that ‘this person is so beautiful, if I were a girl I would have married Him.’ This was Swa-vimohini Maya of Bhagwan, through which Bhagwan Himself was deluded. Vimukhjan- vimohini Maya is when the people who were against Bhagwan were deluded by Him, like the gate-keepers of Kamsa. Swajan-vimohini Maya is when Bhagwan deludes his own people, like Bhagwan deluded Yashoda Ma to make her forget the virat-roop (cosmic form) she had seen in the Lord’s mouth so that her vatsalya (motherly love) for the Lord can be expressed. Yashodaji had so much mamta and vatsalya for Bhagwan that she woke up each day singing ‘My Krishna, my Gopal’ and all her actions were for the Lord alone! In life, joys and sorrows come to us from our relations. If we don’t have proper relations then we become weak and situations become very strong. But if we are related to someone who is available all along, who responds whenever needed, who takes care of us, and about whom we are sure that he won’t leave us, such relation alone can give us joy. All other relations in this world, no matter how thick they are, only end in sorrow, anxiety and worry. No relation can be a source of everlasting peace and joy because the requirement of our life cannot be fulfilled by anybody. We want attention, love, purity, honesty, and unceasing support. And all these things can be given only by one relation and that relation is with the God. A very interesting thing about God is that – He becomes as is required for us. Lord has the capacity to become anything; He can become a bore, a fish, a tortoise, a lion, a human being. For us, he can become any kind of Lord at any time. Whole sadhna is to make the Lord live in your life as you want. If you want Him to become your friend, He will become like that. If you want Him as a child, He will become your child. 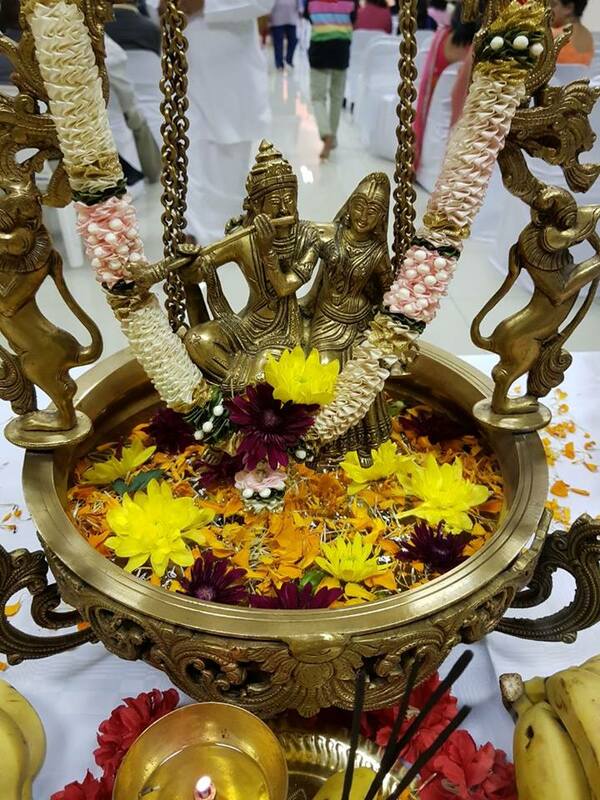 Difference between a statue and a vigraha (idol) is that – in the shop, nobody offers bhog or agarbatti to the statue and hence it is not live, but Shri-vigraha is that where ‘pran’ (life) is present and you offer everything knowing that Lord is accepting your offerings. When you are praying, He becomes a listener. And after hearing, His heart melts. Yashodaji wanted Bhagwan to come to her as a baby, and so Lord became Kanha for her. Yashodaji had a very thick relation with the Lord. Even after having a lot of servants in her house, Yashodaji herself used to prepare butter for Bhagwan Krishna. She was very possessive about Bhagwan. 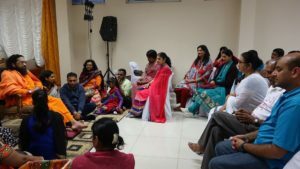 While Yashodaji was churning the butter, from the mouth, she was continuously chanting the name of the Lord, and in her mind she was thinking about the leelas of the Lord. We have a tremendous capacity to give joy to the Lord. With our hands and legs, we can do a lot of things and give a lot of joy. With the mouth we can give a lot of joy by saying good words. Anything you do, keep in mind, “Oh Lord! May you be happy. May you be pleased with me. That’s all I want.” Gopis, while doing their household chores, or taking care of their children, or even while taking bath or getting ready, used to think, “Let Bhagwan be happy with my cooking, with my bathing, with my combing.” Any action you do, think, “Oh Lord! I am yours. Please be pleased with me.” Moment this sankalp comes, your mind will become quiet. In life, we must have a goal which is higher, attractive and inspiring. Such a goal can be the Lord alone. When we have Lord, then our worries will wither away because even if we lose everyone and everything, we will still have the Lord with us. Like we take impression about other people, that he is a good person, he is a devoted person, he is very regular, he is very soft spoken etc. Similarly, when we seek the Lord alone, Lord also takes impression that this devotee wants me. Mother Yashoda had so much of thirst to feed the Lord that the Lord also became desirous and hungry in front of her. Whole upasna is we make the Lord hungry, and we make the Lord a listener. It is the uukhal leela of the Lord which has made many Sadhus, it is this leela of the Lord which made Chaitanya Mahaprabhu, Mahaprabhu. This is the leela, which very few devotees revel into. To revel in the world is very easy, even dogs and cat revel, but to revel in God, you need a lot of punya and lot of fortune. Our mind is very scattered, thrown at various places, wanting various things. The Lord has done all these leelas to attract our mind. To hear Krishna leela is great fortune and to revel in Krishna leela is greater fortune. Uukhal leela of the Lord was the acme of Bhagwan’s baal leela! One morning as the Lord woke up, He was hungry for Yashodaji’s milk. As Yashodaji fed Him her milk, the milk kept on the burner starting boiling and spilled over. To attend to it, Yashodaji kept the Lord down and went. This enraged little Bhagwan and he broke Yashodaji’s pots and started feeding the butter to the monkeys. As the Lord was feeding the monkeys He was very fearful of mother Yashoda and when she came near Him, He started running. Yashodaji ran behind the little Lord with a stick in her hand. This was the first and the last time that Yashodaji had taken a stick. Sukhdevji here says, the one who cannot be caught by sense organs and mind, this cowherd woman wanted to catch by hand. When Yashodaji got exhausted, she stopped and Kanha too stopped. When Yashodaji called Him, Kanha went closer to her. Holding the hand of the Lord, Yashodaji took Him and tried to tie Him to a mortar (uukhal). Yashodaji was insistent on punishing Kanha that day. She took the rope from every house in Gokul and yet the rope fell short to tie the little Lord. A Mahatma passing-by suggested her, to swear by the devotees of Kaliyuga, and the Lord got tied by Yashodaji. When we put effort, and feel we can tie the Lord, Bhagwan also runs away. But when we surrender, He ties Himself for us. Our efforts have to be coupled with His grace. In whose control is the whole world, He was under the control of one illiterate cowherd women, who made cow-dung cakes, who milked the cows, who never chanted the mantras of the Vedas, and who had no knowledge of the shastras. All that she had was, pure love for Bhagwan. When the Lord toppled the Yamlaarjun trees, it was Nanda Baba who untied the Lord. The Lord being extremely soft had a permanent mark of the rope on His stomach. He thus got the name Daamodar. When Nanda Baba said to the upset Lord that he may from now onwards be with Nanda Baba only and not with Maiyaa (mother Yashoda), He can eat butter from Nanda Baba and sleep with him only, Bhagwan jumped from Nanda Baba’s lap and ran to mother Yashoda. Yashodaji embraced Him and fed Him. Yashodaji was the only one to whom Bhagwan had surrendered. The whole leela was to tell the world that a devotee’s love can tie the Lord also. Yashodaji gave fame to all the devotees. This is the power of devotion and love. We are caught up in our own small world. But if we could also love the Lord even little, our life too would be fulfilled, complete. Life is not meant for any position or money or power or relations. It is meant to surrender to the Lord. May we also love the Lord like Yashodaji.